Traders are always seeking trends, but monitoring them is not always an easy feat. To help simplify this task, many traders choose to employ trendlines, channel lines and moving averages to gauge the ripples and to help separate the false breakouts from the real ones. Four decades ago, Dr. Alan Andrews developed a method to identify and border the deviation from the main path of the market in an effort to better deal with the spillage of markets from the “core” of the trend. 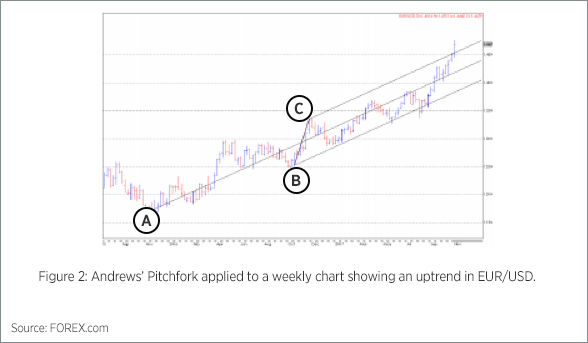 The result, named Andrews’ Pitchfork, is a channel that offers support and resistance around a median line. As shown in the figure above, traders will initially seek the uptrend between A and B, and during this phase they will use the standard trend analysis methods. Andrews’ Pitchfork comes into play only after the market has formed a significant peak at point B and turned against the direction of the original trend. How far will this countertrend move go? The immediate answer can be found by using a full set of Fibonacci retracement levels. In the example above, you would connect the coordinates A and B of the original uptrend, and then connect point C, where the market found support. This will create a channel in the general direction of the trend that is bordered by point B and C. This will also divide the channel in two equidistant sections. The centre line, which will become the handle of the pitchfork, will then stretch backward to point A, which marks the beginning of the uptrend. This grouping of lines resembles a pitchfork, hence the name. Figure 2 shows an example of a weekly chart with an upward trend on EUR/USD (Euro/U.S. Dollar). The initial uptrend unfolded between points A and B. After the pair formed a peak at point C, a line was drawn down and backward to B before turning up again. The lines making up Andrews’ Pitchfork were then plotted. The line arising from point C (which was the trendline, in this case) provided good, but not perfect, support. In addition, the parallel line rising from C (which was actually a channel line) held strong until the last week displayed on the chart, when EUR/USD blasted it away. While that could be construed as a failure of the indicator, traders who were long for the duration of the uptrend would still have profited by holding their long positions. 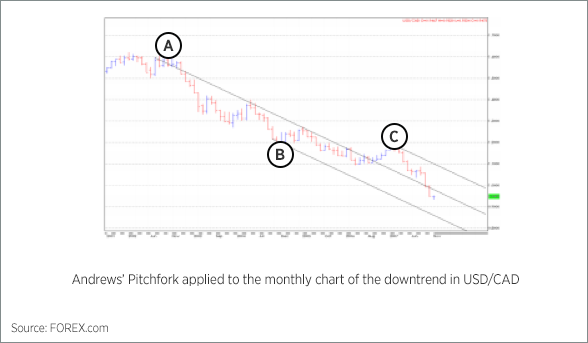 Andrews’ Pitchfork can also be applied to a downtrend. As shown in the figure above the monthly chart of the downtrend in USD/CAD (U.S. Dollar/Canadian Dollar). The initial downtrend is marked by points A and B. After the pair put in a seemingly important bottom at B, an initial declining channel could have been plotted. Once USD/CAD bounced to C and then turned down again, Andrews’ Pitchfork was drawn. The extension of the pitchfork, or the middle line, acted as a declining support. The support line gave way in anticipation of an acceleration of the major downtrend, and the grand target became the line declining from point B. The outside lines of the pitchfork should provide the sloped trading range of the market, so a trader may choose to buy after a bounce back from the support or following a pullback from the resistance, with the size of the trade biased in the direction of the trend. If the declining resistance in a downtrend or the rising support in an uptrend gives way on a closing basis, then the trend is in danger and probably over. If the market price fails to surpass the centre line in either direction, then you may want to look at a pause in the trend. Finally, if the rising resistance in an uptrend or the declining support in a downtrend gives way on a closing basis, then the trend is accelerating. For as long as the trend maintains medium to low volatility, three prongs will suffice. But what if the trend accelerates? In this case, one could extend the distance between the centre line and one of the external prongs, or half of the Andrews’ Pitchfork, in the direction of the breakout. Figure 4 shows an example of a breakout above the rising resistance in the weekly EUR/USD chart. The uptrend is accelerating and the initial target of this breakout is half of the original pitchfork channel. The target is the red line that is parallel to the rising pitchfork. You may also notice the rising consolidation that occurred just before the break on the upside, marked by the last bar on the chart. 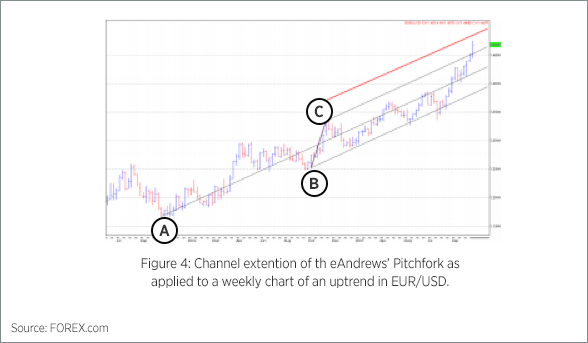 Andrews’ Pitchfork can be an excellent tool for trend analysis that can help deal with the deviation or the changing angle of a trend. Andrews’ Pitchfork also works well combined with other technical indicators. Many traders add Fibonacci retracement and extension levels to the standard three-pronged pitchfork.